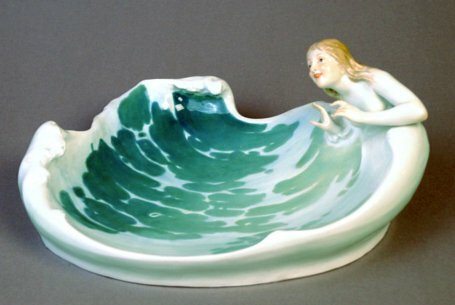 Meissen dish 'The wave'. First modelled by Konrad Hentschel ... Meissen dish 'The wave'. First modelled by Konrad Hentschel in 1898. Meissen dish 'The wave'. First modelled by Konrad Hentschel in 1898. An example of the model is illustrated in Meissen Porcelain of the Art Nouveau Period by Johannes Just. Illustration 26. In his text Just has attributed the incorrect model number and modeller to the piece. Crossed swords in under glaze blue. Incised model number Q 169. Assembler's number 65.